The records of the Second Surveyor's District of Tennessee are found at the Tennessee State Library and Archives (TSLA) in Nashville, Tennessee. Many of the records have been microfilmed by TSLA as part of series number 11 (Other Land Records), Record Group 50 (Early Land Records). The records of the Second Surveyor's District include a total of 9,091 surveys and accompanying plats. The records also include a corresponding entry for each survey, but these entries generally contain less information than the corresponding surveys. The time period covered (from 1807 until 1831) is an important one in middle Tennessee. The year 1807 was the date that the land included in the records of the Second Surveyor's District was first settled following the cessation of Native American claims to that land by the First and Second Treaties of Tellico. Many early settlers who acquired land during that period did not record the deeds (or grants) for their land in county deed records. In addition, some or all of most grants in middle Tennessee were resold to other settlers by land speculators. These re-sales were not recorded in any central registry but are implied by the language in later entries and surveys. Therefore, finding a grant in an ancestor's name does not mean that he ever lived on that land. 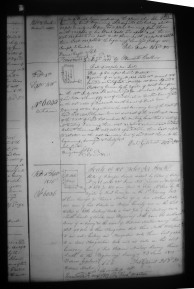 Sometimes the only records that show a family acquired land in middle Tennessee are the entries and surveys of the Second Surveyor's District. The Second Surveyor's District included all (or almost all) of the present-day counties of Bedford, Coffee, Franklin, Lincoln, Marshall, and Moore, as well as parts of the present-day counties of Cannon, Giles, Grundy, Marion, Maury, Rutherford, Warren, and Williamson as illustrated in Figure 1. 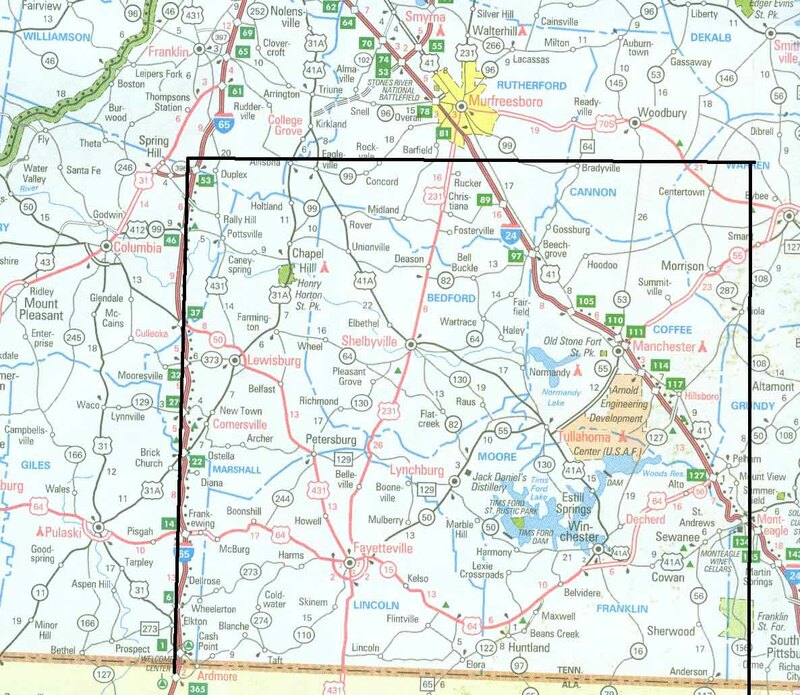 More information is available concerning the Surveyor's Districts of Tennessee in general as well as the Second District in particular. 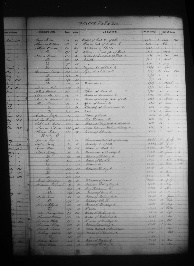 There is a 244 page handwritten index to the surveys of the 1st through 3rd Surveyor's Districts. It is the third volume recorded on Roll 24 of Record Group 50, and is therefore difficult and time-consuming to access and use from microfilm. 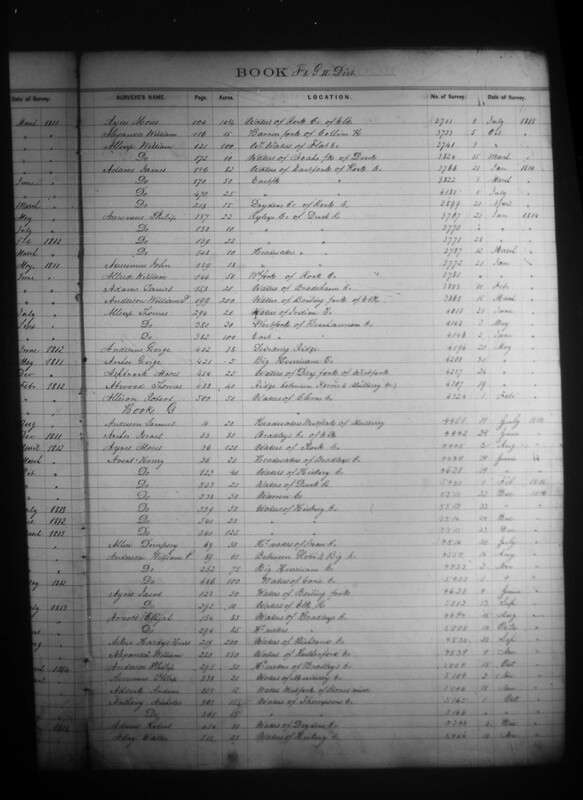 The index is semi-alphabetical and contains the name of the grantee, the number and location (book and page) of the survey in the record books, the number of acres, and the date of the survey. For example, the index entries for the name "Michael Fisher" are given in Table 1. The 9091 surveys of the Second District are recorded in 11 survey books as listed in Table 2.
a plat or drawing illustrating the location of the land and often including significant landmarks as points of reference. A transcription and the actual page image of a typical survey follows. Note how the survey indicates where a settler lived (Mrs. Lilley, not necessarily the same person who owned that land) as well as an important landmark (a meeting house). By virtue of an entry number 7646 Dated 18 March 1815 founded on certificate number 1123 for 100 acres issued to Patton and Erwin by the register of West Tennessee on the 15th of July 1812, I have surveyed for Michael Fisher assignee of said Patton and Erwin 50 acres of land situate in Bedford County and on the West waters of Rock Creek in a South branch of Duck River. Beginning at two sugar trees in the West boundary line of the tract of land that Mrs. Lilly now lives on and East of the North East corner of this tract of land that includes the meeting house that is East of William Husting's. Running a thence West 80 poles to an Oak and two walnuts thence North 106 and 6/10 poles to a red Elm, thence East 70 poles to a stake in the West boundary line of said tract thence to the beginning. Page 251 in Book H that contains the above survey is available by clicking on the thumbnail image in Figure 3 to view the full size image. Excellent information about how to read the specialized language in surveys may be found at the DeedMapper site. Some information on terms found in old Tennessee surveys may be found here. A list of historical names for common trees (often used in the descriptions in surveys) may be found here. Today, the records of the Second Surveyors District are only available at TSLA. This microfilm in not in the LDS library system, so it is not widely accessible through local family history centers. 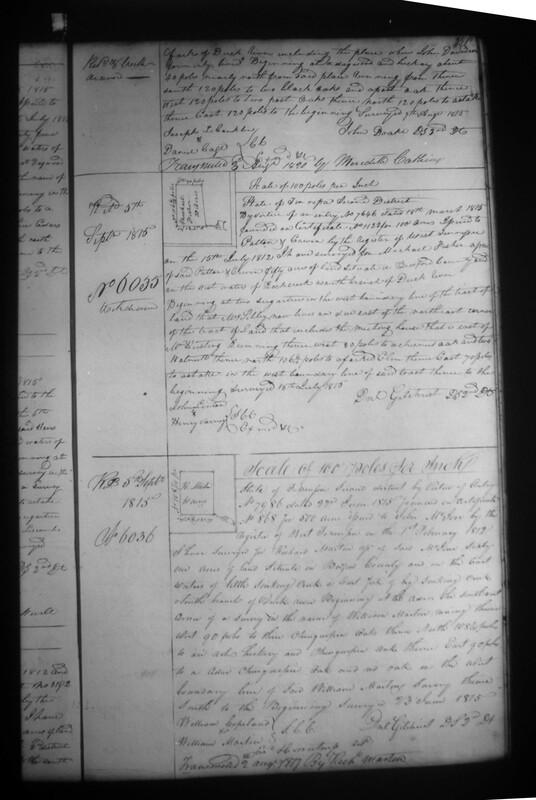 Steve Carson is currently writing a book indexing and abstracting the records of the Second Surveyor's District. It is expected to be published in 2008. GSC Associates currently provides a service that furnishes searches in the survey index as well as copies of surveys by e-mail.